You might have noticed that there was not much posting during the last two weeks. Sorry for that! Well, my free time is limited and I used most of it for sewing during the last days. I wanted to finish a big project so badly and it was worth it since I can wear my new Trench Coat now. Here is my new wardrobe piece. I used a pattern by Burda from the August 2009 magazine. 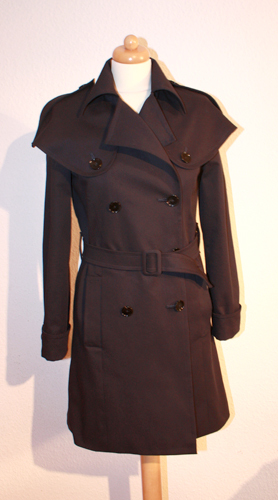 The fabric is a dark blue cotton Gabardine, the buttons are made of horn. What I love most about my trench is the perlerine! It gives this seriouse coat a whimsical character. 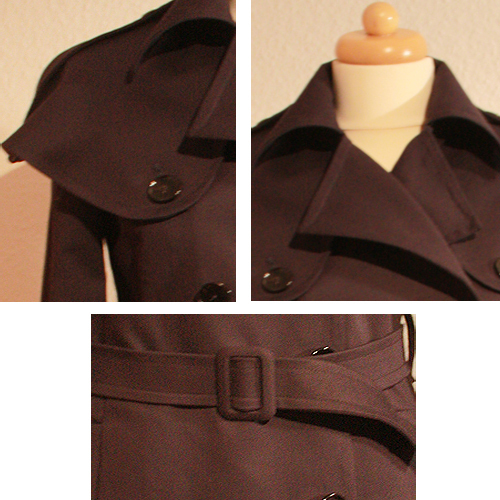 This entry was posted in Sewing and tagged Burda, selfmade, sewing projects, trench, Trench Coat, Trenchcoat. Bookmark the permalink. That’s a beautiful piece! I love it!